The sudden ascendance of air power at sea in the years after the First World War caused navies to scramble for ways to take advantage of this new weapon, as well as defend against it. The solution was adding float planes as the only practical means (at first) of recovering an airplane launched from a ship. Battleships and cruisers began sporting, first improvised platforms, then later, catapults. The primary role of these float planes was reconnaissance: eyes in the sky to help locate targets, then acting as gun spotters to improve accuracy. Some carried bombs and other weapons, but their primary task was scouting. By the start of the Second World War, the development of aircraft carriers was gradually making float planes obsolescent, yet they continued playing an active role right past the end of the war, especially patrolling from land bases. A fairly typical float and the one that became iconic for the US Navy was the OS2U Kingfisher. Developed by Vought (but also built at the Naval Aircraft Factory in Philadelphia), the Kingfisher was cheap thanks to its Pratt & Whitney R-985 Wasp Junior engine, but also under-powered. Still, over 1,500 of them were built, and served throughout the war as the Navy's chief observation plane. Battleships and cruisers carried Kingfishers (the lack of folding wings meant they could not serve aboard smaller ship), though most served in coastal patrol squadrons (in both float and conventional landing gear versions). The Kingfisher was employed as well by the USMC, the Coast Guard, as well as in several foreign services, including the UK and Soviet Union. Kitty Hawk has extended its small but growing portfolio of aircraft, usually ones overlooked by the mainstream kit makers, with a Kingfisher that can be built in both the float plane and conventional landing gear models. Because the Kingfisher's float was detachable, modelers can build ship-borne planes either in at-sea mode (with float) or in port (conventional gear). The kit offers a good level of detail, including a finely-rendered P&W Wasp Junior engine. The exhausts are hollowed-out (though builders may want to take the hollowing-out a bit further), and the area behind the engine, but in front of the cockpit firewall is unfortunately detailing that will be hidden unless the cowling is built in the open position. The only additional detailing suggested for the engine will be the ignition wires from the magnito (which is quite delicate and should be removed carefully). The cockpit has excellent detail as well, though super-detailers will likely have options, including wiring or fabric seat belts (the kit includes PE belts). The canopies are prodigious, and come packed in their own separate box for protection during shipping. I'm hoping Eduard is working on a set of masks. The kit's dimensions look correct, at least when compared with the quarter-scale line drawings in the back of Dana Bell's book on the Kingfisher (reviewed on Aeroscale here). Dry fitting indicated no obvious problems, which is a blessing in an aircraft with the added complexity of wing floats. The instructions are the usual exploded-view style, with 31 sub-assemblies. The plane can be built with the float or with conventional landing gear, and the canopies allow for open or closed options. One significant shortcoming in the kit is the omission of the Vought floats and beaching gear. The Kingfisher employed two types of floats, with the second usually referred to as the EDO float (from the Edo Aircraft Corporation). To see the differences, click here. According to Dana Bell, the Navy detested the Vought floats because they were less-robust, but pre-war "yellow wings" Kingfishers assigned to battleships had the Vought floats to start. Then in early 1941, they were repainted overall Light Gray. 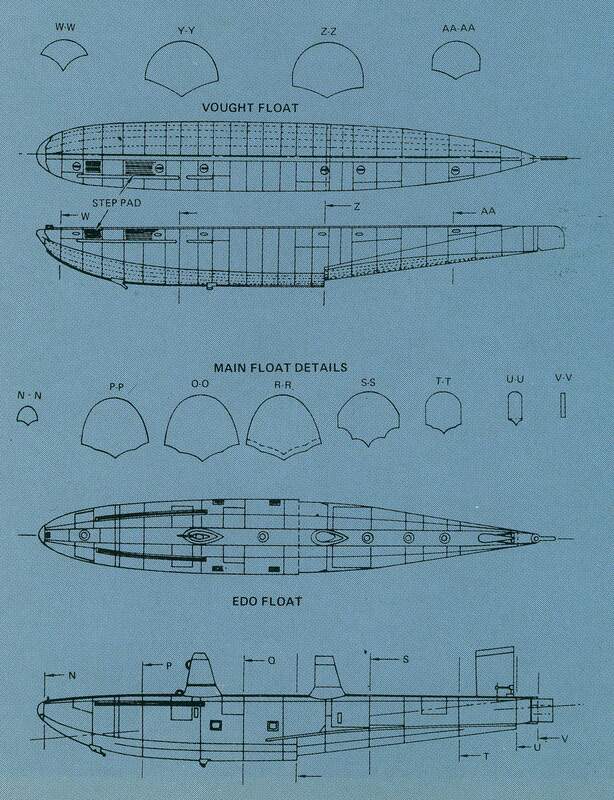 Then the Vought floats were gradually replaced with Edo floats and beaching gear in late July/early August. The aircraft were once again repainted (this time to Light Gray/Blue Gray) by September. The only guidance I can offer is to check your sources before making a decision whether to build one of the USS Arizona) or USS Pennsylvania planes with the kit (EDO) floats. The kit does show a plane from the USS Pennsylvania with conventional landing gear (the custom when the battleships were in port), so this is one solution to the problem if you are intent on building a battleship-based Kingfisher, but are unsure whether you can use the kit-supplied floats. Kitty Hawk has indicated to me they may release the Vought floats at a later time. And perhaps an AM resin company will offer the Vought floats at some point? In any case, it's not a huge knock on what otherwise looks to be a splendid build, since once the war started, the Vought floats were ditched in favor of the EDO variety. Even a casual search of the Internet shows many more varieties of markings and paint schemes for both the US and UK versions, so modelers will have a wide range of possibilities for this kit. Again, it is hoped the AM decal makers will offer additional options, especially in the mid- to late-war camouflage scheme. Kitty Hawk continues to delight with important aircraft that have been ignored by mainstream manufacturers, and the Kingfisher is no exception. The iconic Navy observation plane, it will be welcomed by modelers working in 1/32nd scale. The build options are quite nicely-varied, and the kit appears as though it will build up into a fine model right out of the box. * The cruiser USS Milwaukee was transferred to Soviet usage in lieu of Italian war prizes that could not be sent to Russia following Italy's surrender in 1944. Highs: Clean parts, little or no flash. Wide array of painting & marking options. Lows: Kit includes EDO floats & beaching gear, but omits Vought floats often used on pre-war "yellow wings" variants shown in the painting guide. Verdict: Highly-recommended for the fan of float planes. One of WW2's iconic aircraft now in 1/32nd scale at last. Tiny violins, Rowan, haha! You quarter scale guys get all the good airframes, we're just catching up in 32-scale. When someone asks me what 1/32nd scale plane I wish would be released, I pretty much say "any." Did the RAAF use any of these loverly looking float planes? Rowan, of course I agree with you, and I would be happy to see KH scale down their CADs and do a quarter scale version. The more, the merrier. My old eyes can't handle anything below 1/32nd scale however. 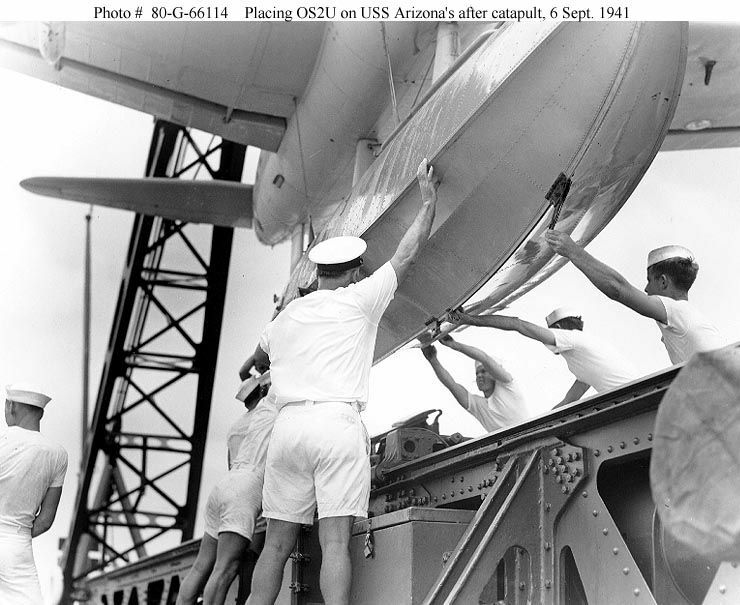 I have seen a photo on another forum showing a Kingfisher being loaded aboard an after catapult on the USS Arizona that clearly has an EDO float, so I'm no longer positive you can't build the "yellow wings" versions in the kit with EDO floats. Go figure! Thanks, Dana, for clearing that up.